Come & enjoy our spacious, well-lit and quiet 2BR apartment on beautiful Mercer Island with mid-century modern details, featuring a floating corner fireplace. It comfortably sleeps 4 and is just 15 minutes away from both Seattle & Bellevue. 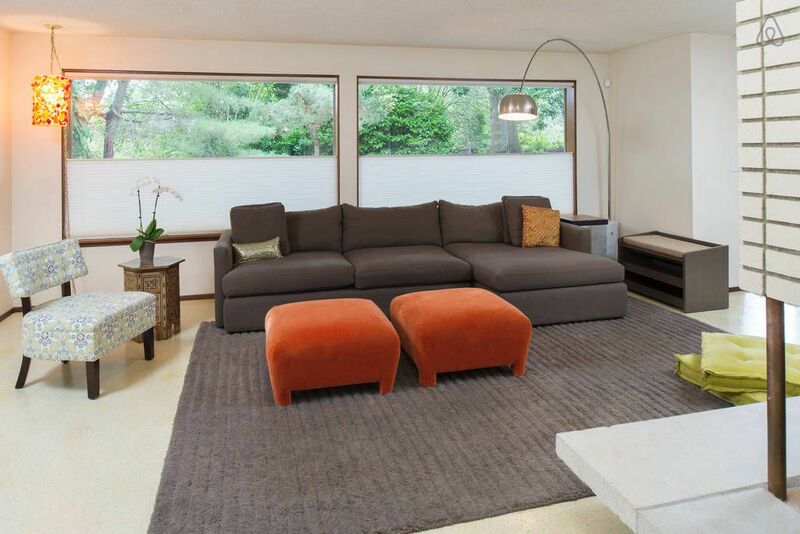 Enjoy a newly remodeled Kitchen & direct access to a private Garden Terrace. There is truly no other rental like this available on Mercer Island. Enjoy the open, airy vibe of this spacious apartment, while enjoying western-facing sunsets filtered through a tree lined garden terrace. Guests will have access to the entire 2BR Lower Level apartment, including a newly remodeled Kitchen, dedicated Laundry Room and Garden Terrace. My daughter and I live on the Upper Level of this home full-time. It's my hope to greet you upon arrival, offering suggestions of must-see sites and attractions, if desired. Otherwise, I will leave you to enjoy the lovely Lower Level apartment in peace, and of course available if any questions arise. Within a 5 minute walk there is a bus stop that services the length of Mercer Island. From the North-end park & ride, there are several buses that can whisk you to Seattle, Bellevue or Redmond. If driving, it’s worth noting that Mercer Island residents are allowed to use the HOV lane on and off the Island, even with only one occupant. This apartment is perfect for traveling nurses, or anyone looking for a quiet place to recover while in treatment at Fred Hutchinson, Swedish, Children’s, Virginia Mason, Group Health, Overlake & the UW Medical Center. I welcome small pets, though please note that my yard is not fully fenced in. I'm an Architect, originally from NY, but now living and working in Seattle, WA. I absolutely love to travel and immerse myself in local cultures through art, architecture, music, and of course, lively conversations! I also greatly enjoy cooking and learning more about celebrated dishes from place to place. This home has a lot to offer. Above all else, it's a comfortable retreat nestled in the wooded heart of the South-end of Mercer Island. The community here is wonderful - very safe, friendly & welcoming. Located in Lake Washington, you have easy access to the city sites, natural beauty and cultural experiences of both Seattle & Bellevue. This apartment is spacious, private and serene offering all the comforts of your home away from home. We were disappointed in our stay, the apartment was dirty and poorly maintained. Furnishings are old and run down with dressers with loose or broken nobs, lights that don’t work and no ability to control the inside temperature. Would not stay here again. We had a lovely time staying in the apartment on Mercer Island. Suzanne was an excellent host and made sure that we had everything that we needed. We were there with our 2 year old son and found the space to be very easy for a small child. There's a great backyard space that our son just loved playing in. If you're looking for a spot on Mercer Island, would recommend this spot. My family and I truly enjoyed our family reunion week at Suzanne's home. Family from Arizona, and New York and Mercer Island used this as our 'home base' for the week. The lower level apartment was just right for us. It was easy to find and access according to Suzanne's directions. We were provided with plenty of fresh linens and kitchen essentials, TV, Wifi, and laundry facilities. Apartment is just as pictured on her site. Grocery nearby. Beautiful patio. Easy access to bus transportation into Seattle. Only issue was that there was no lighting on the walkway coming down from the parking area to the sliding door. Was very dark at night and slippery on the way down. Would highly recommend this rental and would definitely stay here again. Thanks Suzanne! Excellent location...Mercer island is a great getaway destination. Great place in a fantastic area! We enjoyed exploring the area and this house was perfect! I booked this for my family (grandmother, mother, 5 year old and 1 year old) who stayed here for 4 nights. They really wanted to like it, but unfortunately the experience was not a smooth one. Here were the pros & cons. - On check-out day, we were asked if we had plans to leave earlier as the owner wanted to address the water leakage. We were also told that the maids were arriving at 9am instead of the official check-out time of 11am. At the end, the owner informed us saying she was able to find maids who could come later, but we felt somewhat harassed nonetheless.